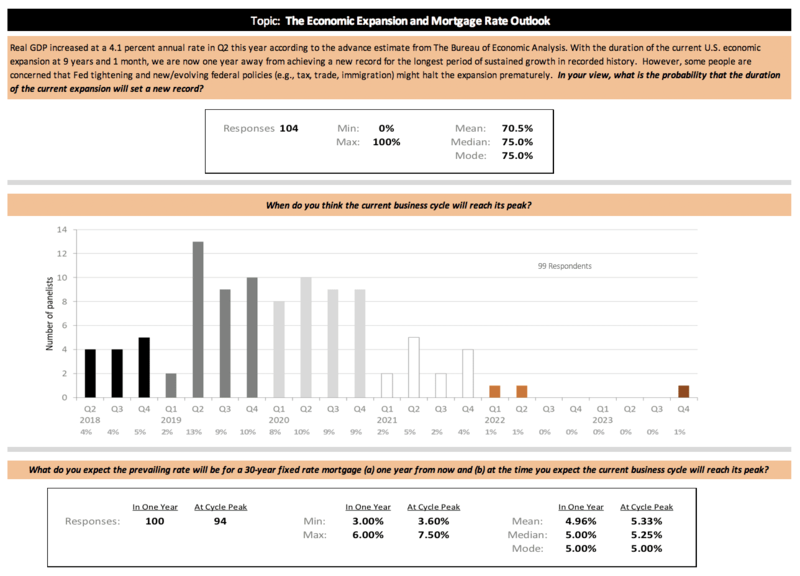 The Q3 2018 edition of The Zillow Home Price Expectations Survey–conducted by Pulsenomics LLC via a panel composed of more than 100 respected economists, housing analysts and investment strategists–included a compilation of expert opinions concerning when the current economic expansion will peak, mortgage rates one year from now and at the cycle peak, and the probability that the duration of this growth cycle will be record-setting. Most experts say there’s better than a 70% chance that the duration of the current economic expansion will set a new record. A majority of the respondents (52 percent) expect the cycle peak will be reached sometime after next year. The table below summarizes the experts’ views on these topics.